This is a lovely recording. It is always good to be reminded of Monteverdi’s third extant opera and the least well known of the three. It’s also a sad reminder of how much of his work has been lost. However, this recording gave me a lot of pleasure. There aren’t as many recordings out there of Ulisse as there are of Orfeo or Poppea. It has structural flaws which probably place it below its two companions, but what is represented here is excellent. This recording’s USP is that Martin Pearlman has made his own performing version of the score, working from the only surviving manuscript copy. He explains his editing decisions in the booklet note, and you can also hear him talk about it at length here, if you’re interested. You’d need to be a greater expert than I am to pick out any major differences from pre-existing versions. Suffice to say that Pearlman makes his own decisions about how to fill in the gaps that have been left in the score. The result is a labour of love in which he has invested much of his time, energy and passion, and that comes across in what you hear. He has also assembled a team who have bought into his vision completely, performing with passion and total commitment. 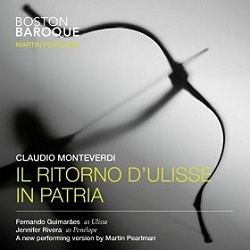 Central to the sound-world of the recording is the playing of Boston Baroque, Pearlman’s own band. They sound as marvellous as their other recordings have led me to expect. There is a slightly acidic quality to their sound but it is very energetic and full of affection. This is a score, and an edition, that Pearlman knows well and wants to bring to life with beauty and affection. There were innumerable touches that brought it to fruition, such as the chattering brightness that the winds often brought to proceedings. Pearlman's way with the dance music is very convincing. I also loved vitality of the score for the brief pastoral scene at the opening of Act 2, full of tremendous verve. The orchestral accompaniment to the gods’ scene in the third act also sounds very fine. Throughout the opera there is a focus on beauty above all. This never undermines the drama, however, and many little touches bring that to the fore over and over again. The singing cast is excellent, too. Fernando Guimarães is magnificent as Ulisse himself. His voice is passionate, ardent and fully committed, a delight in this role which he makes sound totally human. His mannerisms are technically very impressive too. He knows and loves the style of the period, which makes him a first-rate travelling companion for Pearlman's vision. Jennifer Rivera’s Penelope is, if anything, even better. Hers is a low, slightly husky voice but I fell for it completely. Her portrayal of the queen is sensual and dignified but deeply felt, and her opening lament is something that not just welcomes you into the opera but gets you hooked. She is equally fine during the climactic scene of Act 2 when she presents Ulysses' bow to the suitors for the contest, full of possibility but also ample regret. The greatest moment in the opera comes in the final recognition duet, where the voices of Guimarães and Rivera blend beautifully while the orchestra spins a beatific web of sound around them. It’s a magnificent ending to the disc. Aaron Sheehan is a dashing, youthful-sounding Telemaco, who sings with ardour and passion, linking him with but setting him apart from the sound of his father. As Melanto, Abigail Nims is energetic and skittish, a strong contrast to Penelope. Their duet towards the end of Act 1 is beautiful, not least due to the contributions of the Boston Baroque strings. Daniel Shirley's Eurimaco manages to convey much of the character's duplicity, and his voice blends beautifully with Nims’. Daniel Auchincloss is a surprisingly virile, affectionate Eumete, while Marc Molomot cuts a slightly ironic, rather unpleasant figure as Iro, but at least he knows that the part is little more than a comic caricature. The trio of suitors are surprisingly sympathetic, and their Act 2 trio with Penelope (Ama dunque, sì, sì) is very beguiling. Antinous has an eerie resonance, however, and Ulysses Thomas' resonant bass brings him to life very compellingly. The gang of gods are also very convincing. João Fernandes is a rich, boomy Neptune — beautifully accompanied, first by the buzzing organ then by endearingly chattering cornetts — while Owen McIntosh's tenor makes a surprisingly young-sounding, vigorous Jupiter. Leah Wool is at first slightly warbly as Minerva, but she sounds more comfortable as the opera progresses. Sonja DuToit Tengblad is a bright, sparkly Juno. The Prologue, too, sets the tone for the rest of the opera to come: bouncy and full of life; not at all a mere forethought. The chorus don't have much to do, but what they have is done very well with lots of energy and bounce. Even aside from its unique qualities, this Ulisse sits pretty close to the top of the available recordings that I’ve heard. Its studio perfection is more welcoming than Alan Curtis’ live version, for all its merits, and, while I acknowledge his importance, I’ve never been able to love Harnoncourt’s version which sounds paradoxically wilful and underdone in places. René Jacobs typically has his own quirks and, for once, I thought they worked rather well, but I now rate Pearlman’s version very highly too. Definitely worth a look for Monteverdians old and new.